As we wait for player tracking data to be released by a pro ultimate league, here's research that was recently published. 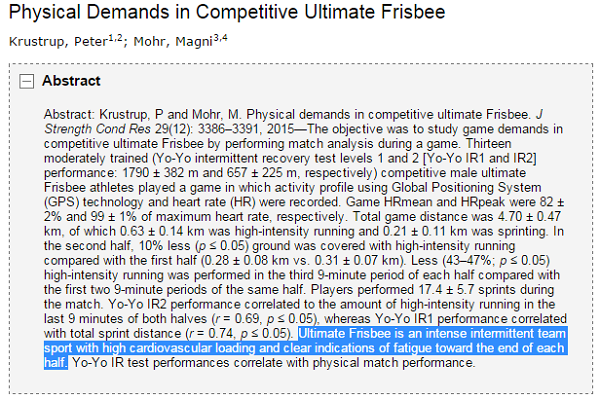 In the December 2015 issue of Journal of Strength & Conditioning Research (the official research journal for National Strength & Conditioning Association), an article titled "Physical Demands in Competitive Ultimate Frisbee" was written by Peter Krustrup and Magni Mohr. 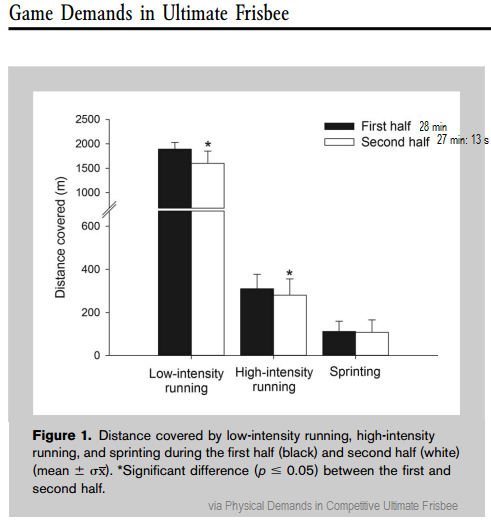 The research studied an ultimate game between 2 teams of male "athletes" from University of Exeter Ultimate Club documenting heart rate, traveled distance, and "high-intensity running" (which is different than sprinting). Abstract: The objective was to study game demands in competitive ultimate Frisbee by performing match analysis during a game. Thirteen moderately trained (Yo-Yo intermittent recovery test levels 1 and 2 [Yo-Yo IR1 and IR2] performance: 1790 ± 382 m and 657 ± 225 m, respectively) competitive male ultimate Frisbee athletes played a game in which activity profile using Global Positioning System (GPS) technology and heart rate (HR) were recorded. Game HRmean and HRpeak were 82 ± 2% and 99 ± 1% of maximum heart rate, respectively. Total game distance was 4.70 ± 0.47 km, of which 0.63 ± 0.14 km was high-intensity running and 0.21 ± 0.11 km was sprinting. In the second half, 10% less (p ≤ 0.05) ground was covered with high-intensity running compared with the first half (0.28 ± 0.08 km vs. 0.31 ± 0.07 km). Less (43–47%; p ≤ 0.05) high-intensity running was performed in the third 9-minute period of each half compared with the first two 9-minute periods of the same half. Players performed 17.4 ± 5.7 sprints during the match. Yo-Yo IR2 performance correlated to the amount of high-intensity running in the last 9 minutes of both halves (r = 0.69, p ≤ 0.05), whereas Yo-Yo IR1 performance correlated with total sprint distance (r = 0.74, p ≤ 0.05). Ultimate Frisbee is an intense intermittent team sport with high cardiovascular loading and clear indications of fatigue toward the end of each half. Yo-Yo IR test performances correlate with physical match performance. The study claims to be the first to examine the activity profile and cardiovascular loading during a competitive ultimate game. The study began with 15 participants, but data drew from 13 - due to injuries. Of the 54 minutes of game time, 26.6 +/- 5 minutes was spent above 90% maximum heart rate. Conclusion: High-intensity intermittent training regimes, such as an aerobic high-intensity training and speed endurance training, should therefore be given high priority in the physical preparation of ultimate athletes. 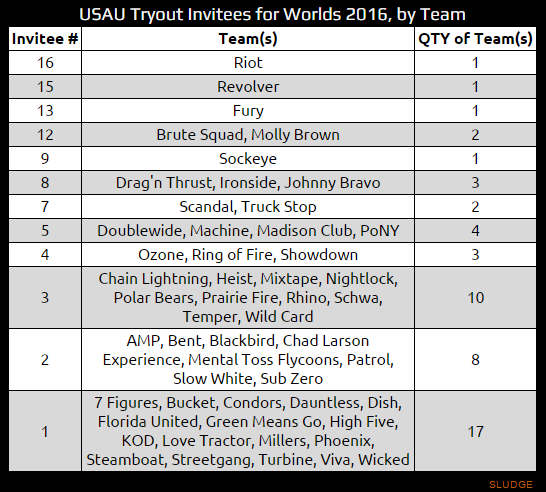 USA Ultimate posted their invite list for tryouts for the US National Teams in the women, mixed and men (open) division to compete at the 2016 World Ultimate and Guts Championships -- June 18-25 -- in London. 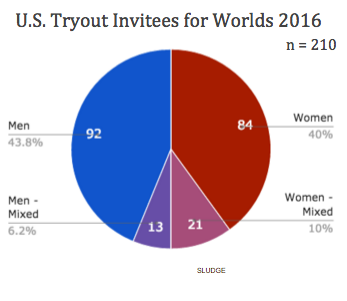 Overall, 210 players were chosen from nearly 600 applications. Fifty-three (53) club teams are represented - 21 men's teams, and 16 teams from both the women's and mixed division. For the women invitees, 80% (84 players) most recently played in the women's club division, while 21 (20%) played in mixed. For the men invitees, 87.6% (92 players) played in the men's division while 13 (12.4%) played in mixed. Good luck to all players on making the U.S. National Team! 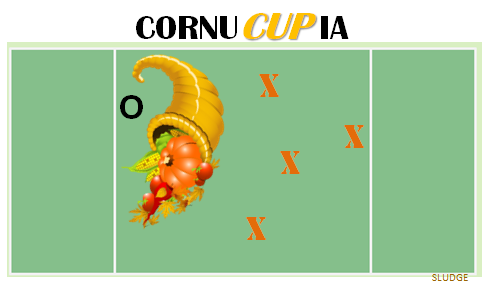 Here's a perfect defense for your Thanksgiving Day ultimate game. Ultimate is a fast-moving team sport that emphasizes athleticism and sportsmanship. It combines the aerial passing skills found in football with the quick transitions from offense to defense found in basketball, all using a high tech plastic disc (frisbee). [Ultimate is] action-packed, exciting and a lot of fun. It's very camaraderie-based; that's the spirit of the game. Players strive for a high level of competition but still have an appreciation for the other team. Ultimate combines several aspects of other sports and has become a good fit for some athletes who want to remain competitive but in a different sport than they previously played....Ultimate utilizes basketball skills like cutting in order for players to get open, while also engaging soccer skills like moving without the ball or Frisbee and using intricate passing plays to set up scoring chances. Each team has seven players on the field at one time. Ultimate Frisbee is a limited-contact team sport, where players pass a Frisbee to each other in an attempt to score points in opposing end zones. Players can't take steps while in possession of the disc. ...a mix of soccer, American football, netball and basketball. Unlike virtually any other sport, it is self-refereed even at the highest levels. Thanks for visiting this SLUDGE blog. 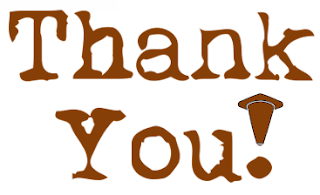 Thanks for following &/or RTing &/or liking any SLUDGE tweets. Thanks for sharing any SLUDGE posts via any/all social media options. 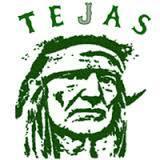 Austin Tejas over DC-area Black Cans & Highlands 17-11 (9-7). 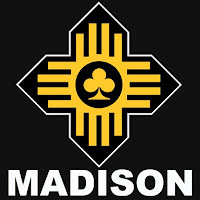 Medellin Colombia Revolution over Madison Heist 17-9 (HT 9-6). Madison Club over Bogota Colombia Comunidad El Oso 13-12 (7-6 HT). Minneapolis Drag'n Thrust over Austin Doubledown 17-11 (9-5 HT). Players from winnings teams took home gold medals while each team was awarded this artsy trophy. USA Ultimate published a timeline of their organizational logos. 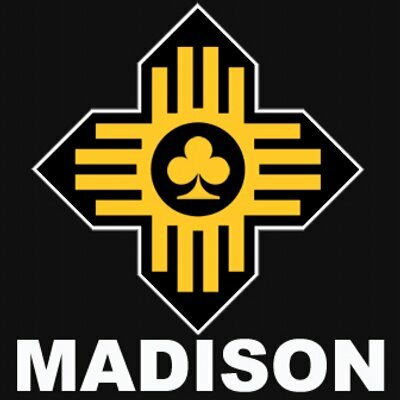 Created as "Ultimate Players Association" in December 1979, the non-profit has, surprisingly, just 3 logos in its 35+ years. USA went from being formatted as vertical text to under- and overlined aside the all-caps "Ultimate" to the current version with USA sliding atop the left stem of "U" in ULTIMATE. 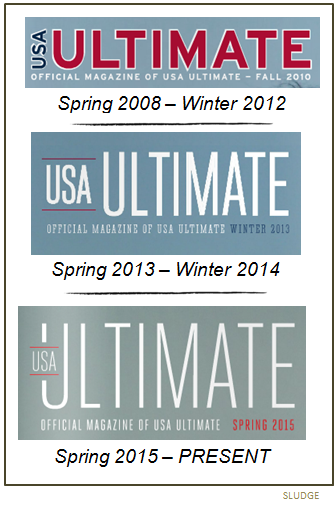 "USA Ultimate: Official Magazine of USA Ultimate" has been the magazine title since the spring 2008 issue. Before that, the magazine was titled "Ultimate News" from Spring 2003 – Winter 2007 issues. The original publication name (1980 - Winter 2002) was "The UPA Newsletter." The current President of the United States is no stranger to the sport of ultimate, and now there's a new world leader with experience as an ultimate coach. 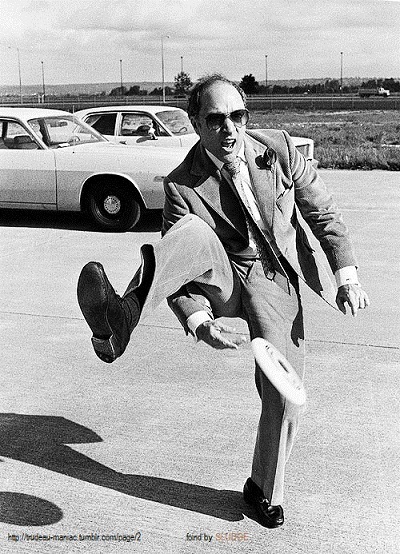 Say hello to the Prime Minister of Canada - Justin Trudeau. Prime Minister Trudeau took office on November 4, 2015, and is the 23rd PM of Canada. 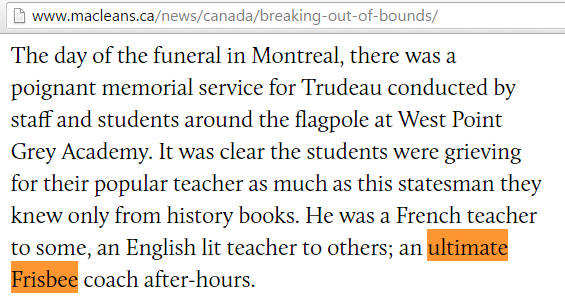 This 2012 article cites Trudeau coached "ultimate Frisbee" at West Point Grey Academy - a private day school in Vancouver, BC: "He was a French teacher to some, an English lit teacher to others; an ultimate Frisbee coach after-hours." Toronto-based VC Ultimate took the opportunity to share an ultimate jersey with their new Prime Minister. Mixed ultimate team Max Power out of Toronto upgraded their jersey designs with a bat flip to their hometown MLB team. After a 6+ month hiatus, MLU's poodcast Cleats and Cufflinks returns. Episode 24 [November 9] was with regular contributor Nic Darling ("Cleats"), but minus "Cufflinks" (Jeff Snader) who stepped down in September. 1. 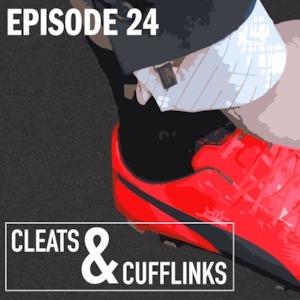 Cleats and Cufflinks podcast has new cover art. If you look closely, you will see MLU cufflinks aside red PUMA cleats because the podcast is still titled, Cleats & Cufflinks. 2. Cleats and Cufflinks clocks in at under 30 minutes. This format change was mentioned late in the podcast as "a little shorter, a little tighter." And, Nic joked: "Maybe some people will miss the extensive banter, but that's the way it is." You might remember back in April 2015 I asked for a more "succinct podcast" and voila! 3. 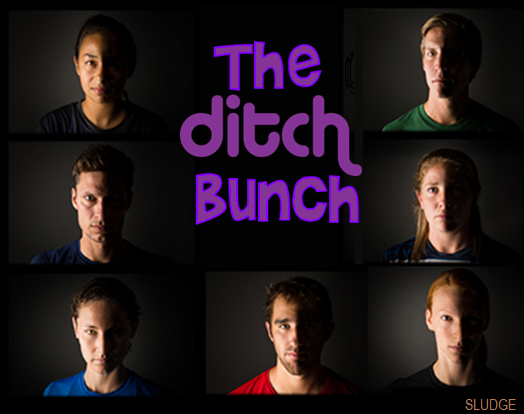 The MLU drafted a strategy for their 2014 season. Now, for the 2016 season, MLU Executive VP Nic Darling describes Major League Ultimate as a more welcoming organization in regard to MLU's strategic positioning. [MLU is] "looking at the whole pantheon of ultimate. and saying: we're a piece of this, but there are all these important parts of it that we should be paying more attention to...that we should be talking about, that we should getting input from. We want to become sort of a stronger and better part of the overall community." An example of this strategy can be seen with MLU's recent article praising USA Ultimate's partnership with Boy Scouts of America. 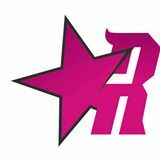 The Ultimate All-Stars from the U.S. - "Team E.R.I.C." - went (2-0) during their Manila Spirits Exhibition Series presented by Ditch. Final stats - goals and assists - from the games against Philippines and Japan are below. NOTE: Games were under WFDF rules and played to 19. 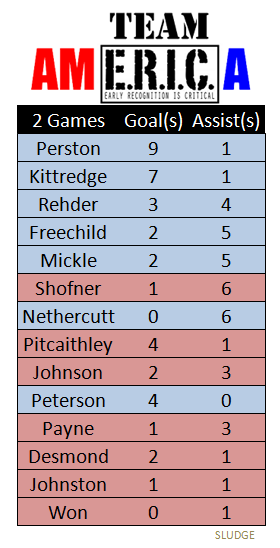 There were 9 West Coast players on the team - Perston, Kittredge, Rehder, Freechild, Shofner, Pitcaithley, Johnson, Desmond and Won; the Left Coasters accounted for over 2/3 of the U.S. offense (69.7%). 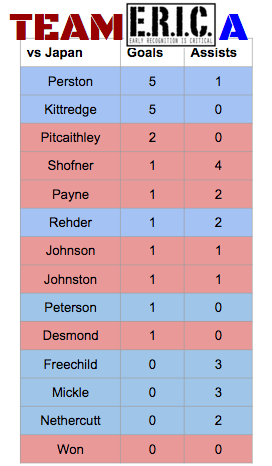 Oregon-based players (Perston, Freechild, Shofner) contributed nearly 1/3 of the offense [31.6%] for Team America. Congrats to Team USA! Team E.R.I.C.! Team America! The last exhibition game for Team AmE.R.I.C.a resulted in a 19-15 win (10-9 HT) over Japan. Ten different players scored, while 9 U.S. players threw a score. Timmy Perston land Beau Kittredge led all scorers with 5 goals, each. Jesse Shofner had a team-high 4 assists. Starbucks decision to design a red cup created a controversy. 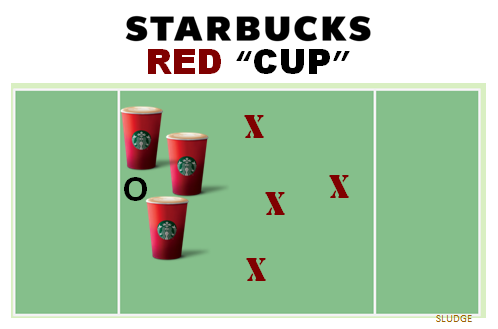 But, by the looks of it, the red cup appears to be a standard 3-3-1 zone defense for ultimate. 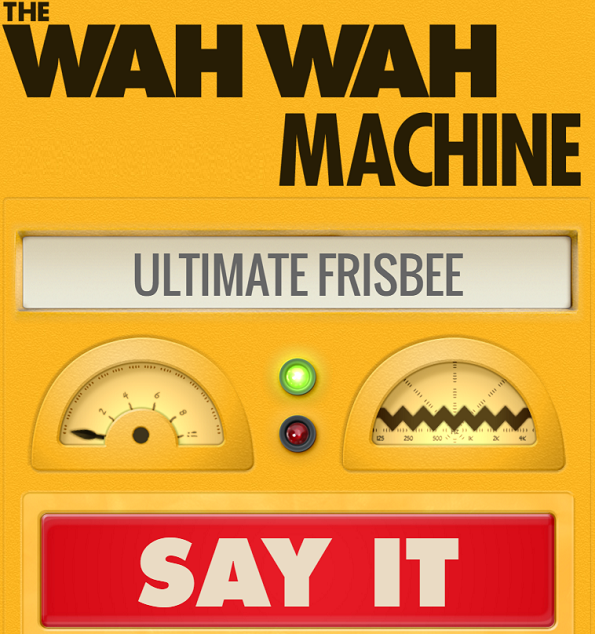 T'is the season to play ultimate! The bunch of U.S. ultimate All-Stars return to the field after a 19-12 (10-6 HT) win over the Philippines on Wednesday. The game between "Team AmE.R.I.C.a" and Team Japan will air at 8pm tonight as part of Manila Spirits All-Star Exhibition Series presented by Ditch. During Wednesday's exhibition game of "Team amERICA" versus the Philippines, nine different players of the 14-player roster scored for the U.S., while 11 different players threw a score. Timmy Perston led all scorers with 4 goals. Jon Nethercutt had a team-high 4 assists. Watch a replay, presented by Ditch. 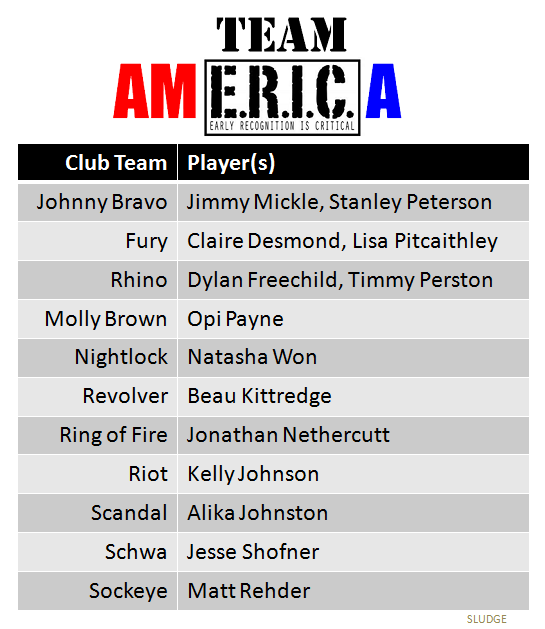 Fourteen players on USA All-Stars ("Team ERIC") - let's call them Team AmE.R.I.C.a - play in tonight's mixed exhibition ultimate game versus Philippines. 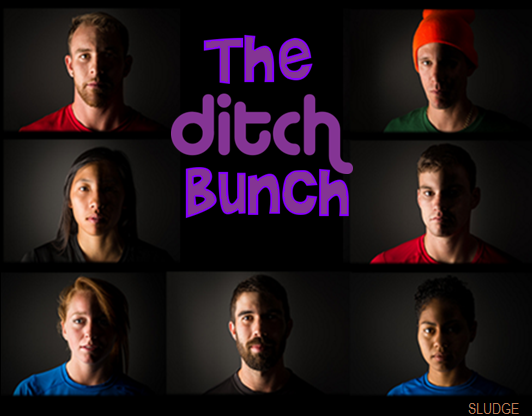 Eleven club teams are represented on the U.S. ultimate roster; zero from the mixed division. Five out of 8 USAU club regions are represented - Northwest (5), Southwest (4), South Central (3), and both Mid-Atlantic and Southeast (1). Nearly two-thirds of rostered players are from West Coast club teams. Watch the game tonight at 8pm ET, presented free by Ditch. 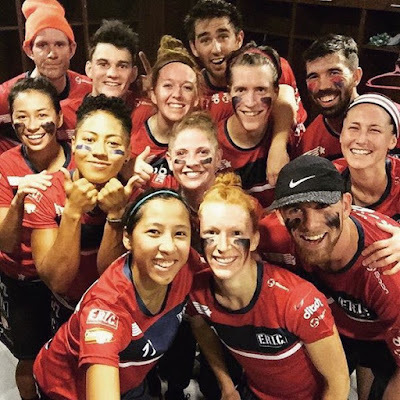 From Skyd's first post on coverage of ultimate: "For years, the sport has been clamoring for something more and that something is now beginning to arrive." 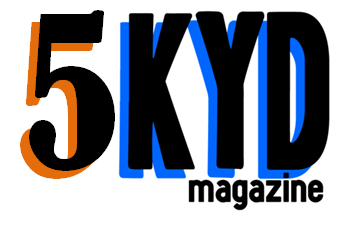 Congrats on 5 years, Skyd! The Manila Spirits All-Star Exhibition Series - presented by the new broadcasting company, Ditch - is scheduled to cover two international friendly games this week. Viewing is free of charge. The USA exhibition mixed ultimate team is made up of top players from the around the country. Ditch has been giving background on each of the fourteen players in lead up to this week's games. [Counter clockwise] Johnston. Kittredge. Desmond. Mickle. Johnson. Shofner. Freechild. 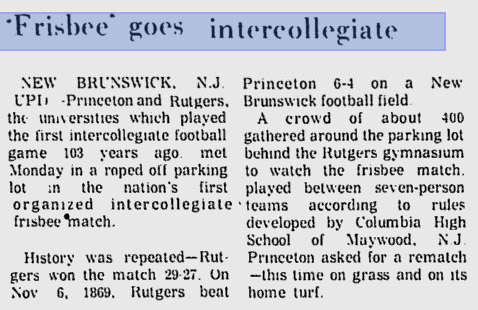 The November 6th game was organized by Irv Kalb – a Columbia High School graduate and a freshman student at Rutgers – on the same date Princeton (nee College of New Jersey) and Rutgers played the first college football game in 1869. This game was originally scheduled for early October, but changed to coincide with the historical football date. 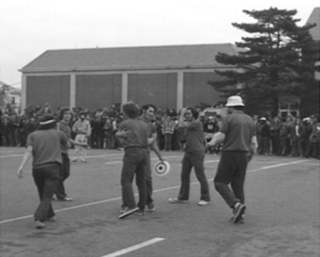 The New York Times covered the college sporting event, and a local paper note a crowd of "about 400" watched the match which was played on a parking lot. The Nationals aren't the only D.C. team with a new coaching change. The D.C. Current (MLU) announced its first coaching change in franchise history as Keven Moldenhauer preferred playing to coaching. Keven's quote from the article is "Simple answer. I miss playing." Coach Moldenhauer ends his MLU coaching career with an (18-12) regular season record over 3 seasons; a (2-1) postseason record; 1 Eastern Conference crown (2014); and 1 MLU Championship (2014). 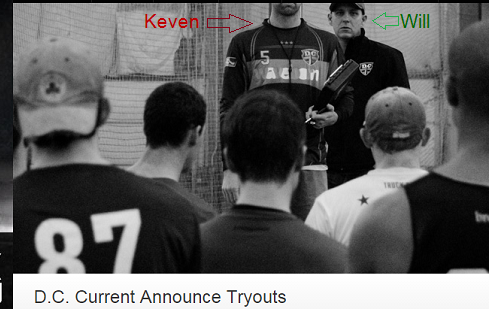 If you have been following recent Current news, you may have noticed this coaching change was intimated with articles talking about next season without a quote from its head coach from the past 3 seasons and by literally chopping off Keven's head when promoting tryouts for next season (see below). Defensive Head Coach Will Smolinski will take over as Head Coach of the Washington D.C. Current. 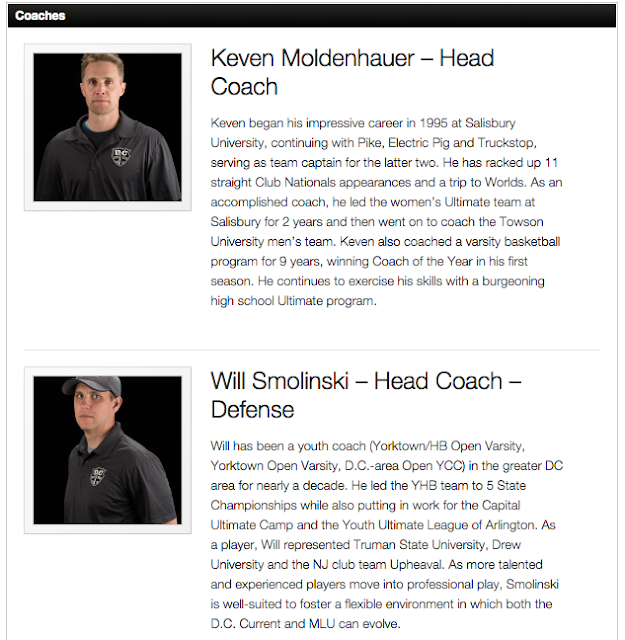 Screengrab from DC Current coaching staff web page. If you were hiding under a Frisbee yesterday and did not hear the news...2-time AUDL MVP Beau Kittredge, signed with the Dallas Roughnecks for the 2016 AUDL season. After 2 championship seasons with San Jose Spiders (AUDL), Beau Kittredge will play the 2016 season with Dallas Roughnecks. Beau signed a significant contract which includes financial support of a training video and other demands that led him to play with a "Texpansion" team in the AUDL. RELATED: Previous years of signing Beau. Major League Ultimate's DC team - the Current - have scheduled their open tryout for the 2016 season. Tryouts have always been scheduled in the same calendar year of the season. However, this tryout date is the latest scheduling of a tryout. Considering all past seasons have begun in April, final rostering would allow for just a few weeks before the first pull. Last season, the Current went (5-5) in the Eastern Conference and missed the playoffs after advancing to the post-season in the 2 previous seasons. 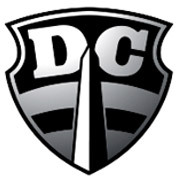 D.C. Current's best season was a (11-1) record in the season, in which they won the MLU Championship. The Current are said to be committed to player development and the future. And the Current hope to continue to find [talent], no matter what club team it calls home." The Hunters become the hunted. 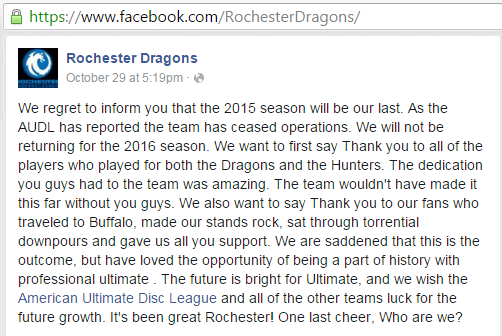 On October 29, 2015, the AUDL announced the removal of the Rochester Dragons (nee Buffalo Hunters) franchise from the league, or what they call "contraction." The Dragons will forever be part of AUDL history. 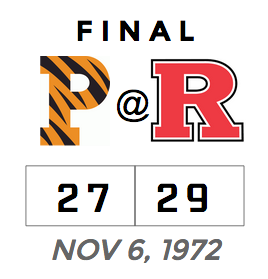 They were the first pro ultimate team to play a weekday game. And, also the first pro ultimate team to host and play in a same day doubleheader (versus Montreal). 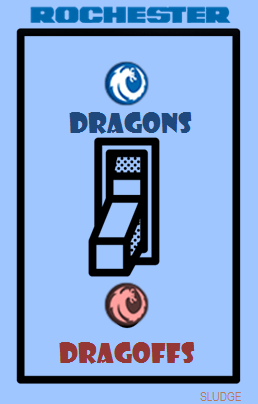 With the Dragons departure, there are no original East Division teams that played in the inaugural 2012 AUDL season, The other three teams - Spinners, Constitution, and Rampage - only played the 2012 season. 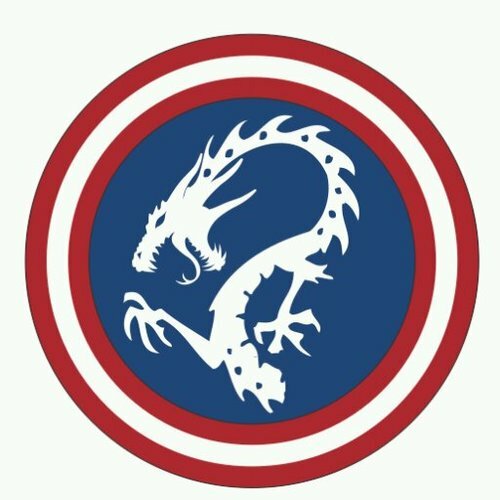 After participating in the inaugural season of American Ultimate Disc League as Buffalo Hunters (3-13), the team won only 8 games in 36 games (.222) as Rochester Dragons. The western New York state team finished in last place of the East Division 3 out of 4 seasons.